I watched this guy race when I was a little kid. The "Iron Man of Motocross" Adolf Weil recently died in his hometown of Solingen, Germany, at the age of 72. During the 1960s and 1970s, Weil competed in the FIM 250 and 500cc Motocross Grand Prix World Championships while riding for the Maico factory motocross team. His name became so synonymous with the brand that the Maico AW model was named after him. Weil never won a World title, but he did finish second to Hakan Andersson in the 1973 250cc Championships and finished third in the 500cc Championships three times. 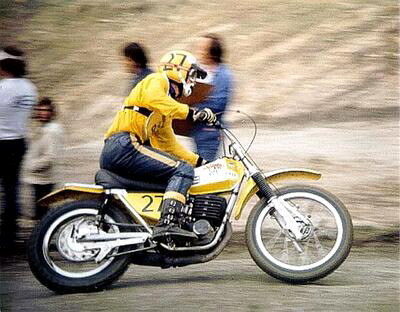 He did win the German MX National Championships 14 times and the Trans-AMA Championship in 1973. He accomplished that feat at the age of 34 while competing against riders much younger than himself. Racing well into his 30s, Weil retired from competition in 1976 and ran a motorcycle business in Solingen with his two sons Frank and Jurgen. The motocross riders of today soar much higher in their jumps, but the racers of yesterday had ***** of steel to ride like they did with their limited suspension travel. I'd never heard of Adolf Weil, but I salute him as a motocross pioneer. We've lost many of the Blues pioneers, not many left. The surfing pioneers have also been dying off. The early motocross and desert racing pioneers are getting up there. They all deserve our utmost respect. I am with you "TOP".. You truly have to admire the older riders... To agree with Surfer- to think of the abuse to the body-due to the lack of gear, suspension, etc..
Could you imagine a rider like Joey Dunlop on a MotoGp bike running Isle of Mann.. Very sad to hear of Adolf Weil's passing. I guess it's fitting that the "Iron Man" lived in Soligen, the cutlery and forging capital of Germany. 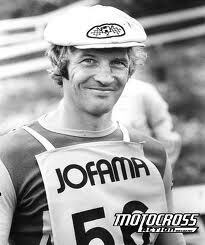 I was a semi-sponsored Maico rider in the early 70's and my hero was the Swede, Ake Jonsson. He, Weil and Gerrit Wolsink made up the heart of the Maico factory campaign. The limited suspension travel wasn't much of a concern to riders back then...we had nothing to compare with. In fact, Maico was considered the "limousine" of racing bikes. You could actually ride most of a moto sitting down instead of up on the pegs. Early Husqvarna riders had to contend with a large, exposed bolt that held the rear of the gas tank down. Guess where your nuts landed if you slid forward on the saddle? I saw Adolph Weil race at Road Atlanta in the early 70's when they used the hillside that is behind what is now the pit lane for a motocross course. Come to think of it, it was probably the Trans-AMA series mentioned. I believe he won the race I attended.